Noel Vietmeyer’s excellent, meticulously researched biography of Norman Borlaug, the plant breeder known as the Father of the Green Revolution, Our Daily Bread, portrays sympathetically one of the great figures of the 20th Century. 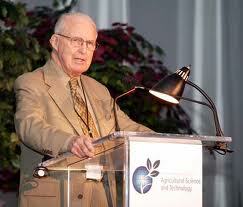 Borlaug introduced several revolutionary innovations. First, he and his colleagues laboriously crossbred thousands of wheat varieties from around the world to produce some new ones with resistance to rust, a destructive plant pest; this raised yields 20% to 40%. Second, he crafted so-called dwarf wheat varieties, which were smaller than the old shoulder-high varieties that bent in the wind and touched the ground (thereby becoming unharvestable); the new waist or knee-high dwarfs stayed erect and held up huge loads of grain. The yields were boosted even further. Third, he devised an ingenious technique called “shuttle breeding”– growing two successive plantings each year, instead of the usual one, in different regions of Mexico. The availability of two test generations of wheat each year cut by half the years required for breeding new varieties. Moreover, because the two regions possessed distinctly different climatic conditions, the resulting new early-maturing, rust-resistant varieties were broadly adapted to many latitudes, altitudes and soil types. This wide adaptability, which flew in the face of agricultural orthodoxy, proved invaluable, and Mexican wheat yields skyrocketed. Similar successes followed when the Mexican wheat varieties were planted in Pakistan and India, but only after Borlaug convinced politicians in those countries to change national policies in order to provide both improved seeds and the large amounts of fertilizer needed for wheat cultivation. In his professional life, Borlaug, who died in 2009 at the age of 95, struggled against prodigious obstacles, including what he called the “constant pessimism and scare-mongering” of critics and skeptics who predicted that in spite of his efforts, mass starvation was inevitable and hundreds of millions would perish in Africa and Asia. His work resulted not only in the construction of high-yielding varieties of wheat but also in new agronomic and management practices that transformed the ability of Mexico, India, Pakistan, China, and parts of South America to feed their populations. How successful were Borlaug’s efforts? From 1950 to 1992, the world’s grain output rose from 692 million tons produced on 1.70 billion acres of cropland to 1.9 billion tons on 1.73 billion acres of cropland — an extraordinary increase in yield per acre of more than 150 percent. India is an excellent case in point. In pre-Borlaug 1963, wheat grew there in sparse, irregular strands, was harvested by hand, and was susceptible to rust disease. The maximum yield was 800 lb per acre. By 1968, thanks to Borlaug’s varieties, the wheat grew densely packed, was resistant to rust, and the maximum yield had risen to 6000 lb per acre.